Equipped with knowledge of business, economics, accounting, and finance fundamentals, financial professionals are the backbone of almost any company or organization. With a bachelor’s degree in finance, you will have the know-how necessary to grow and manage an organization’s wealth, and will be qualified to gauge and control financial risk — skills that are in demand across all industries. In an online finance bachelor’s degree program, you will take courses covering foundational marketing and business concepts, while building in-depth knowledge of finance principles including investment and portfolio management, personal finance, and capital management. Online bachelor’s degree in finance programs are affordable and flexible, making them ideal for working professionals who want to ramp-up their skillset and move forward in their career. As a graduate of an online finance bachelor’s degree program, you can pursue careers as a financial analyst, broker, or financial manager, among others. You may also choose to continue with your studies to earn a graduate degree and land a management-level position. Either way, earning an online bachelor’s degree in finance is the first step to enjoying greater job prospects and higher earning power. 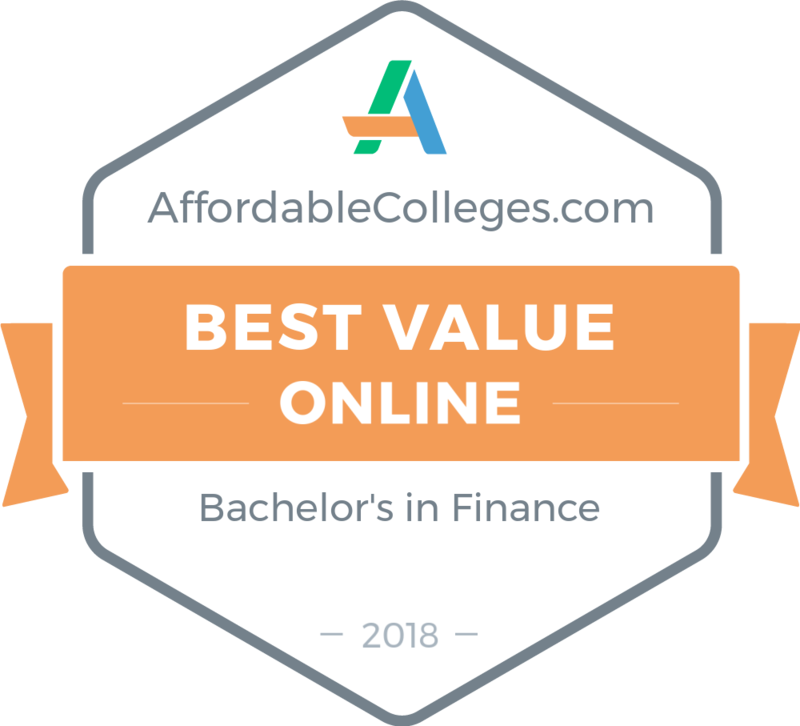 Explore our ranking here to find some of the best and most affordable online finance bachelor’s degree programs available across the country. FIU, located in Miami, Florida, provides business majors the opportunity to pursue one of the best online finance degrees. The completely online program prepares students for a variety of careers, and students learn how to utilize financial knowledge and practical math skills to help companies make important business decisions. The online business administration degree in finance is 120 credits, and major courses include topics such as commercial bank management, securities analysis, and financial risk management. Several prerequisite courses are required prior to pursuing major courses. These include courses in accounting, micro and macroeconomics, and math. Students complete 12 business elective credits that allow them to focus their degree. The affordable program is $212 per credit for in-state students and $329 for out-of-state students, and numerous scholarship opportunities are available for business majors. If transfer students have less than 60 credits they must also submit high school transcripts. Business majors in search of a cheap finance degree online should consider East Carolina University’s bachelor of business administration in finance, one of the best one finance degrees. Students choose from concentrations in managerial finance, financial services, or risk management and insurance. The degree is 123 credits, and students complete 42 credits in general education courses and prerequisite courses including communication, economics, and math. The core business curriculum consists of 36 credits and provides students with a foundation in general business principles and processes. Each concentration is 18 credits and prepares students for career entry or continuing education in finance. Distance education tuition is less than $200 per credit for in-state students, and out-of-state students pay approximately $700 per credit, including technology fees. The university offers scholarships to business students that range from $750 to more than $3,000, and numerous financial aid opportunities are available. Old Dominion University’s online bachelor’s in finance is available as a full program or a degree completion program for students with prior credit. Transfer students are required to complete at least 30 credits at the university. Learners must earn at least 120 credits to graduate. Graduates are prepared to pursue careers in corporate management, securities analysis, portfolio management, and more. The curriculum covers accounting, statistical data analysis, principles of finance, and operations management. Students gain skills in information technology and contemporary management. Most of the course material is delivered asynchronously, which allows students to complete coursework at their convenience. The program’s synchronous courses require students to be virtually present through webcam. The online bachelor’s in finance is affordable for in-state and out-of-state residents. In-state tuition is $335 per credit, the cheap out-of-state tuition is only $35 more. One of the best online finance degree programs in the southern U.S. is found at the University of Alabama-Birmingham. The online format allows students across the nation and the globe to partake in the program’s numerous opportunities, such as completely online coursework, peer networking, and 24/7 online technical support. Students complete 18 credits in financial core courses and 18 upper core credits that focus on areas such as business communication, basic marketing, and information systems. The program’s capstone courses provide students with a synthesis of the program curriculum, and students utilize various skills learned throughout the program to address complex business issues by examining case studies in bankruptcy, mergers, and leases. A final capstone course explores professional topics such as ethical decision making and emphasizes business writing skills. The affordable finance degree online has a flat tuition rate for in-state and out-of-state residents, and online students pay $346 per credit. An online finance degree from SUNY College of Technology prepares students for numerous career opportunities by focusing on key financial issues, including loan and mortgage amortization, diversification, and stock bond valuation. Graduates are employed at banks, insurance agencies, brokerage firms, and financial planning firms. Graduates possess skills in math and a basic understanding of the foundations of finance. In addition to the liberal arts core curriculum, the degree provides students with a strong knowledge base in the areas of business, finance, and accounting. Students can broaden their undergraduate foundation by pairing their finance degree with a minor in economics, which requires six additional courses. Seniors choose to complete a senior project and/or an internship. The internship requires students to complete 15 weeks of supervised training where they gain experience in a variety of tasks such as financial analysis, planning, and evaluation. Located in southeastern North Dakota, Dickinson State offers one of the most affordable online finance degrees. The 120-credit program equips students with a theoretical and practical understanding of business management. Graduates are able to address issues in several areas of finance, including capital budgeting, statement analysis, cost of capital, and more. The BS in finance includes foundational coursework in business. The business core curriculum is 34 credits and focuses on topics such as business law, management and leadership, and business policy. Students gain professional skills and learn to approach problems ethically. The finance core consists of 27 credits, and courses include business valuation and international finance. Coursework is delivered through Moodle, and the university utilizes several online learning tools to enhance course material, including Atomic Learning and NetTutor. The cost of online attendance is $274 per credit, regardless of state residency, and students are required to pay a technology fee of $48.50. The affordable online finance degree from Regis University offers students a unique opportunity to pursue a bachelor’s degree and master’s degree simultaneously through its combined degree program. The combination BS/MBA degree is 158 credits and allows students to quickly earn their master’s degree. The stand-alone bachelor of finance degree is 128 credits and emphasizes international business practices and global economics. The program consists of general education courses, foundation courses, upper division courses, and electives. Foundation courses include topics on business and marketing principles, accounting, and economics. The program also teaches management skills. Upper division courses focus on finance, with coursework including fundamentals of investments and sources of capital. Graduates have an understanding of ethical issues faced by the profession and are able to apply decision-making skills to a variety of situations. Northeastern University Global Network’s online finance degree prepares students for entry-level positions in the field. The BS in finance and accounting management is 120 credits and provides students with an overview of key business concepts, including business law, ethics, and organizational behavior. Students gain skills in the principles of marketing and economics. Major courses focus on finance and accounting practices in a global perspective. Students complete 28 major course credits and are familiarized with the principles of taxation, cost accounting, and financial reporting and analysis. Nine elective credits are required, and students can choose from several topics that cater to their career interests. The international finance elective examines the facets of global business, including trade, tariff policies, and currency. Other available electives focus on topics such as real estate and personal financial planning. The general education coursework complements the program’s emphasis on international finance, and students are required to take courses in diversity and cultural exploration. The finance degree online from Dallas Baptist University is 120 credits and covers key topics that prepare students for successful careers in finance. Students complete 30 major credits that include coursework in principles of financial accounting, corporate financial management, and business and public law. Six social science credits provide a foundation in American national government, and macroeconomics are required as part of the core curriculum. The degree is transfer friendly, and students must complete a minimum of 12 major credits from the university, including nine upper division credits. Thirty of the last 36 hours must be Dallas Baptist University courses. The university offers several financial aid options to help reduce the cost of tuition, and students can pursue scholarships and grants to help make their college experience affordable. Veterans are eligible for the university’s patriot scholarship program that offers several forms of financial assistance, including complete coverage of out-of-pocket expenses for qualifying veterans. Located in Grand Rapids, Michigan, Davenport University offers the Midwest’s best online finance degree with an optional concentration in financial planning that is part of the Certified Financial Planner Board of Standards, Inc (CFP). Registration with CFP allows graduates to conveniently take the Certified Financial Planner exam without encountering the tedious application process. Graduates who pass the exam are able to work as independent financial planners. Students with or without the concentration in financial planning are prepared for numerous careers in the field. Potential careers include auditor, risk analyst, and treasurer. The finance BBA is 120 credits, and the curriculum includes coursework in general education, foundations of business, major topics, and electives. The financial planning concentration requires students to complete 15 credits that focus on topics such as federal taxation, estate planning, and behavioral finance. The online program offers a cheap tuition rate for out-of-state students. The online finance degree from the University of Houston allows students to easily transfer credits from an associate degree to a bachelor’s degree program. The online BS in finance caters to transfer students by combining lower and upper level courses. Students with previous credit can complete the degree in two years. The cheap tuition rates make the online program convenient and affordable. All finance faculty hold terminal degrees and have years of practical experience in the financial industry. The curriculum focuses on topics such as accounting, financial statement analysis, and international finance. Graduates are equipped with the skills necessary to work in corporate finance, commercial banking, investment banking, and several other financial areas. The degree can be earned in about two years by completing 10 courses per year. The finance degree online from Missouri State University is a cheap program for in-state and out-of-state residents. In-state online tuition starts at $285 per credit, and out-of-state tuition is an additional $25. The rates of tuition increase slightly for upper division courses. The online BS in finance consists of general education courses, core business courses, and major finance courses. Students gain theoretical and practical knowledge in areas such as financial management, marketing, personal financial planning, and much more. Students interested in pursuing careers in international business have the opportunity to gain skills in international financial management and international financial statement analysis. Students learn about contemporary approaches to financial management and are familiarized with information systems in business. The university has a partnership program with Ozarks Technical Community College, and students with an associate of arts degree from the college can easily transfer courses toward the online bachelor’s in finance program. The University of Houston offers an affordable online finance degree that emphasizes student success by preparing graduates for a variety of careers in the field. The solution-oriented program emphasizes critical thinking skills that promote company productivity and efficiency. The bachelor of business administration in finance requires students to complete foundational coursework in business and advanced coursework in finance. The degree allows students to choose from two concentrations: corporate finance or investment management. Each track requires students to complete 12 credits of relevant coursework. The corporate finance track includes courses such as treasury risk management, international finance, and derivative securities. The investment management track includes courses in real estate finance and portfolio management. Minoring in accounting, marketing, or economics is recommended by the program, and students take up to 21 additional credits to earn a minor. Numerous scholarship opportunities are offered. One of the Mid-Atlantic’s best online finance degree programs is offered by Pennsylvania State University. The fully online degree prepares students for careers in banking, insurance, securities analysis, and more. The BS in finance is 120 credits, and students complete 89-92 major credits that include finance courses, business courses, and supporting electives. Students gain skills in financial statement analysis, effective business writing, and financial management. A variety of topics are covered that equip students with knowledge in business practices and financial processes. Students are required to complete additional courses in the areas of accounting, economics, and math. Tuition is offered at a flat rate for students enrolled in 12 or more credits per semester, and students with more than 60 credits pay $42 more per credit. Several financial aid options are available, including federal aid and veterans and unemployed workers discounts. Granite State College’s online finance degree is for students interested in pursuing careers as investment bankers, financial planners, credit counselors, and more. The BS in accounting and finance is 120 credits, and 30 credits must be completed at the university. Transfer students can apply prior credit, training programs, and work experience towards their degree. The curriculum includes general education courses. Major courses equip students with the specialized knowledge and necessary skills. Course topics include taxation, auditing, and financial management. Graduates are effective communicators and demonstrate strong critical thinking skills in the areas of financial analysis and accountancy. The affordable program has comparable tuition rates for residents and non-residents of New Hampshire. In-state tuition is $300 per credit, and out-of-state tuition is $335. Students must maintain a minimum GPA of 2.0. The University of Minnesota offers a 120-credit finance degree online. The degree focuses on concepts that prepare students for successful careers as financial analysts, personal finance planners, bankers, and more. The BS in finance emphasizes professional development, and students learn how to communicate effectively, ethically approach business conflicts, and utilize technology to improve financial processes. Students complete 65 major credits, and the business core includes courses in accounting, managerial finance, and principles of marketing. Finance courses build upon general business knowledge, and students complete 40 credits in courses such as corporate finance, estate planning, and investment. Students complete an internship that is a maximum of three credits. The internship gives students an opportunity to apply acquired knowledge to real-world business situations. Learners have the option of complementing their degree with a minor in accounting online. Students at Franklin University have the opportunity to pursue a bachelor’s in financial management or financial planning. Each affordable, online finance degree is 124 credits and includes general education requirements, a business core, major courses, and electives. The BS in financial management is for students who wish to pursue careers as financial analysts, financial risk managers, treasurers, and portfolio managers. The curriculum includes global finance, financial policy, and advanced financial management. The BS in financial planning is ideal for students interested in advisory and consulting positions, and major focuses on investments, tax planning, and financial plan development. Students with prior credit can transfer up to 94 credits toward their degree. The affordable online program has a standard tuition that is not affected by residency, and students have numerous financial aid opportunities including federal, state, and institutional assistance. The online finance degree from Northwood University prepares students to help companies gain capital, generate new jobs, and raise money for urban development. The degree is 123 credits, and students gain knowledge in several key areas such as financial management, real estate finance, and corporate investment decisions. The program’s finance for sustainability course provides students with an overview of environmentally-friendly business practices and investments. Students residing near recreational bodies of water may benefit from enrolling in a course on economics and finance in the recreational marine industry. The course includes topics on the economics of tourism, boat sales, and fishing. Students have the opportunity to participate in a paid internship that includes 400 hours of hands-on experience. Students have the opportunity to begin the program in the fall, spring, and summer. Located in Center Valley Pennsylvania, DeSales University’s online finance degree is 120 credits, and the transfer-friendly university accepts up to 75 credits. Students can apply practical experience toward their degree through the university’s prior learning assessment program. The BS in finance emphasizes a foundation in business ethics, and the curriculum includes courses in the legal environment of business and financial markets and institutions. In accordance with the university's Christian traditions, students complete three credits in Christian values and theology. Students can pursue an accelerated financial planning track that prepares them for careers as financial planners in several settings, such as banks, brokerage firms, and law offices. Online tuition rates begin at $474 per credit, and numerous scholarship opportunities are available to help reduce the cost of tuition. No electives are required, but students are free to take them. The finance degree online from the University of Maryland-University College teaches students how to examine financial data, develop security portfolios, and effectively communicate across organizational levels. Students learn important business theories and concepts that help guide their business decisions. The program familiarizes students with current national and global economic trends and monetary systems. Learners become proficient researchers and learn how to utilize technology to collect and analyze data. The finance bachelor’s degree prepares students for certification exams in management accounting and financial planning. Students examine contemporary issues in finance practices and are presented with case studies to help enhance learning outcomes. The program can be completed entirely online, and transfer students can apply up to 90 credits toward their degree. Students with 90 transfer credits can complete the degree for less than $10,000. Columbia College offers an online finance degree that is part of the university’s business administration program. The curriculum prepares students for entry-level careers and for professional or academic advancement. The program is 120 credits. Student complete 39 upper division credits that focus on a variety of business and finance concepts. The business core focuses on topics including accounting, personal financial planning, business ethics, and strategic management. Students complete nine finance electives, which allows them to choose from topics that fit their career interests. Elective courses include sports finance, international finance, and risk and insurance. Students have the option of completing an internship that fulfills part of the elective requirements. Internships provide students with unique training experiences that enhance classroom material. Students are required to complete 45 field hours per credit and can earn a maximum of 12 internship credits. Metropolitan State University, located in Saint Paul, Minnesota, offers a cheap online finance degree that provides students with the knowledge to excel in the field of corporate finance. Students gain a theoretical understanding of business concepts and become well versed in numerous technical skills. Graduates can conduct financial analysis, financial reporting, and economic research and forecasting. The finance BS is 120 credits, and students complete eight credits in corporate finance and investments and portfolio analysis. Four finance elective courses are required, and students can choose from several topics that will enhance their marketability. Electives include international finance, mathematical modeling, and operations research. Transfer students must complete 30 credits through the university, and 20 credits must be major requirement courses. The average annual tuition is $7,566, and students have access to several financial aid options, including loans, grants, and scholarships. The finance degree online from Baker College provides students with a foundation in business and finance practices and ethical and legal responsibilities of the profession. Students gain a conceptual understanding of accounting, management, and marketing principles. Graduates are prepared for careers as financial analysts, commercial lenders, investment managers, and more. The bachelor of business administration in finance is 181 quarter hours, or approximately 120 credits. Major courses include topics such as computerized accounting, risk management, and personal finance planning. Students are required to complete an internship that consists of 120 hours of work experience. The university offers online students numerous career services, including job search strategies and resume and cover letter writing assistance. Students interested in the online program complete a three-week course that introduces them to the program’s online format. Graduates of National University’s online finance degree can implement quantitative and qualitative data analysis to help businesses make smart financial decisions. Graduates are familiar with the legal and ethical issues that arise in the field and can utilize a global perspective to solve business problems. Student become effective communicators and are well-versed in the various theoretical and practical elements of finance. The BS in financial management is 180 quarter units, which is the equivalent of 120 credits. Students complete five business courses and 11 core finance courses. The business courses provide students with a broad foundation in the areas of management, finance, and accounting. The core finance courses focus on specialized topics such as valuation of a corporation and capital structure and financing. Learners complete a capstone course that synthesizes knowledge gained throughout the program. Located in Hobbs, New Mexico, the University of the Southwest offers a bachelor of business administration with an emphasis in finance that can be completed entirely online. The degree is 120 credits, and students gain skills in the areas of financial analysis, insurance and risk, and financial management. The curriculum provides students with an understanding of financial processes and prepares students for professional roles. Students complete courses in leadership, managing diversity, and strategic planning. Online courses are taught by the business school’s faculty who have diverse professional backgrounds in areas such as energy industry consulting, oilfield construction, and accounting services. The online finance degree is a competitively priced program with tuition rates that begin at $449 per credit for online students. The university offers several grant and scholarship opportunities, including donor funded scholarships for full-time undergraduates with a minimum GPA of 3.0.